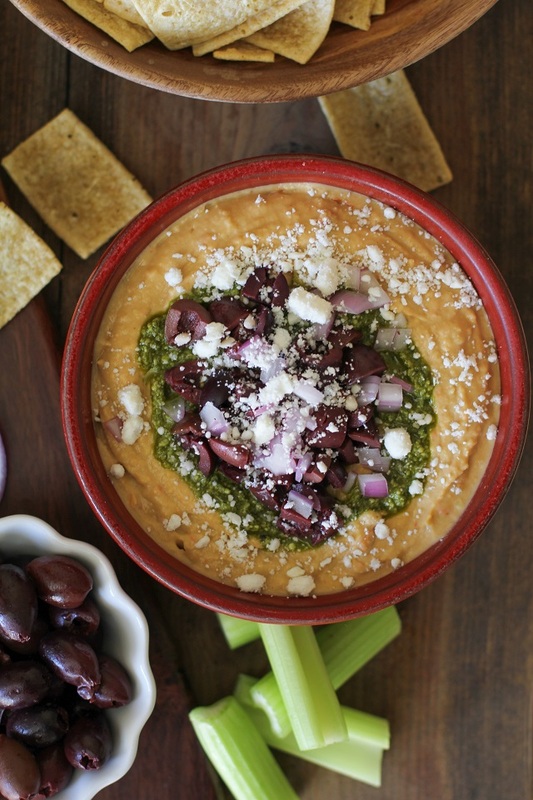 Classic hummus topped with pesto sauce, Kalamata olives, red onion, and feta cheese makes for the perfect appetizer or unofficial meal. You know you’ve just had a great weekend when it rolls into your Monday like the most pleasant fog in the harbor. The kind of fog you want to embrace, take photos of and post on Instagram, and you hope it lingers until at mid-afternoon at the very least while you sip on the most delicious cup of coffee this world has to offer. You can probably deduce, I’m enjoying the weekend fog with my morning cup of Joe, enjoying it before it lifts and the new week officially begins. In this busy life, rarely do we have the opportunity to really stop and smell the lilies on our days off, so when we do, it’s a much needed refresher. As I mentioned in Friday’s post, I left town for the weekend and spent a couple of days in the sunny, warm, blue-skied Sierra Nevada foothills. It was so marvelous snapping photos of the vibrant green rolling hills and blue waterways, flowers, and pretty buildings, and being on no timeline at all. I chatted with friends, sipped on wine, went on a couple of serene hikes. This is the way all weekends should be! 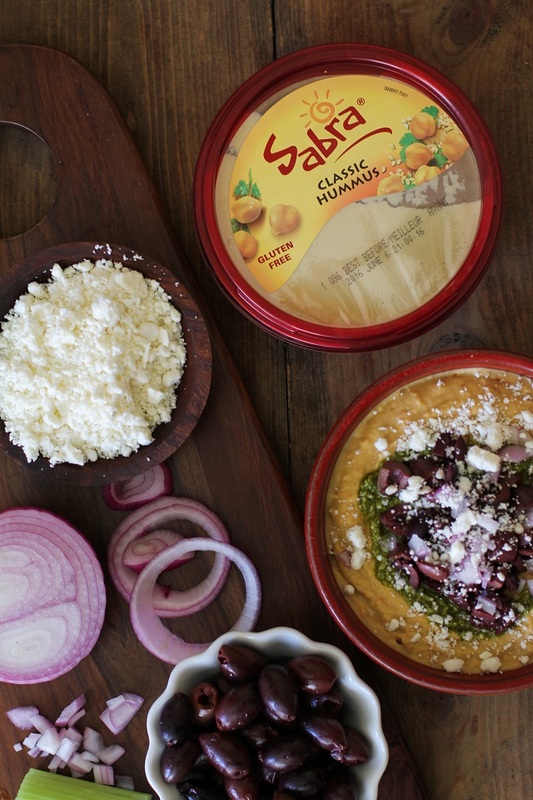 Speaking of taking it easy and slowing down time to really embrace the little things in life, my friends at Sabra asked me to show you all what my casual, unofficial meals are like before or whilst cooking. 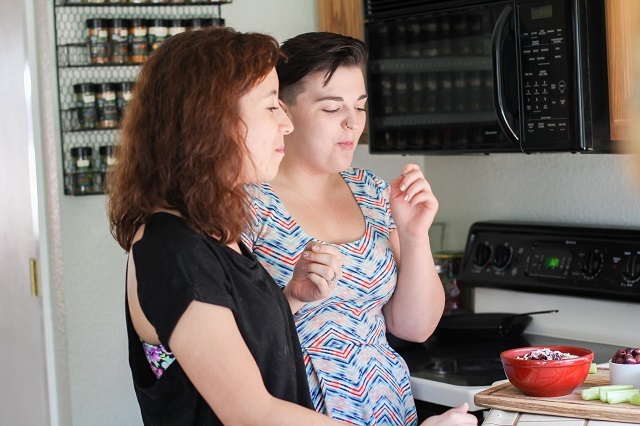 I find the best way of enjoying the process of cooking is to do so un-rushed – with snacks! Particularly of the hummus varietal. Adding various toppings to your favorite dip to make it a flavor blasted, fun experience kicks the whole thing up a notch. Having a bowl of creamy hummus with my favorite toppings to dip into at my leisure is the best way to ensure food prep for the main event feels relaxing versus rushed. The boyfriend and I are especially grateful for hummus and beer after a long bike ride, trail run, or ski. Some of our favorite toppers are as you see here: kalamata olives, red onion, pesto sauce, and feta cheese. I also am a major fan of sun-dried tomatoes, roasted garlic, or even just a little lemon zest and a drizzle of pumpkin oil, truffle oil, or pomegranate molasses. 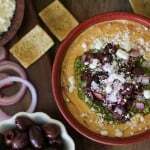 Point is, taking a container of hummus and you-ifying it is a satisfying way of staving off hunger between meals, and the perfect pre-game to an enjoyable dinner when serving guests. A couple of my girlfriends stopped by a couple of weeks ago in the late afternoon and I threw together this Mediterranean hummus platter in the flashiest of flashes. We all dug right in, and the added pesto sauce was the show stopper. This is exactly how the “unofficial meal” becomes the official one. Winky face. 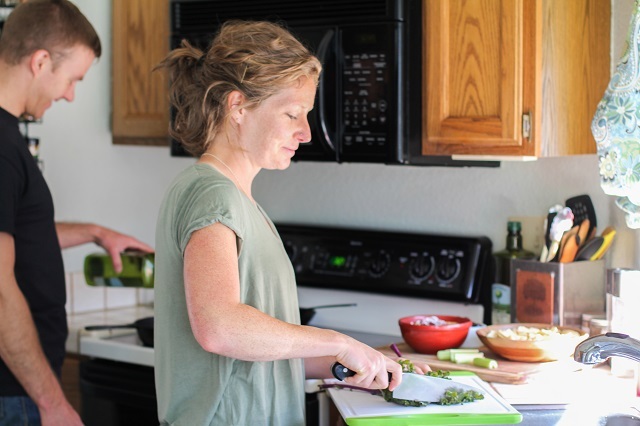 I know what you’re thinking, and yes – my hair always looks this great, and yup, G is always that happy while pouring olive oil. Case in point, a little chip and hummus sitch is always my preference for taking in sustenance pre-dinner. May all your unofficial meals be healthful and easy. Here are my ingredient suggestions – you-ify as necessary! Add all toppings to hummus and serve with chips, pita bread, and/or raw vegetables. 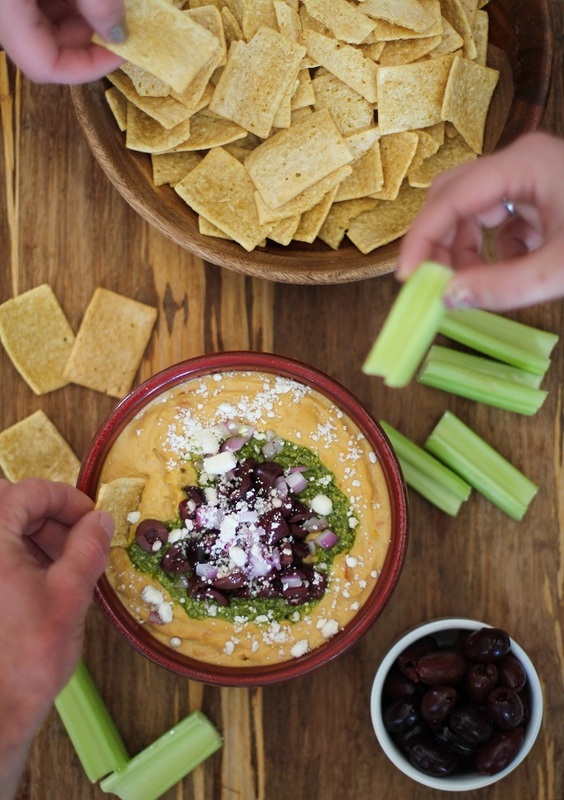 We love to make a meal out of hummus, fun idea for a party! I love that you just added toppings to the hummus. Makes it quick and easy! 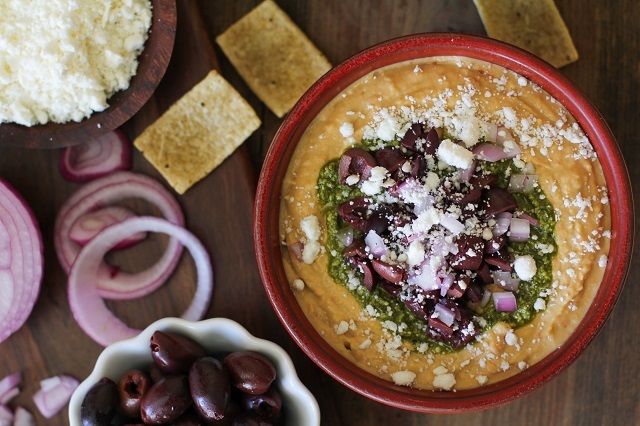 This is great because you don’t even have to make the hummus you can just dress it up deliciously and call it a day! YUM! I need to remind myself to slow down more and just enjoy the day, or the fog! Things seem to be going so quickly these days!